An attractive profile with a greater flow capacity than the Half Round system. 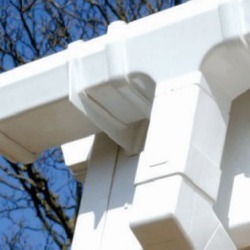 Manufactured by UK market leaders FloPlast, our square guttering connects to most other plastic gutter systems including Brett Martin, Polypipe, Hepworth, Hunter and Marshall Tufflex. It can also be connected to other materials such as cast iron using our range of adaptors. Many Square Gutter systems are not interchangeable, generally because the depth of the gutter differs between manufacturers, as does the angle of the side walls. Floplast 112mm Square Gutters are compatible with those made by Brett Martin, Hunter, Hepworth and Marsall Tufflex, but to check other brands please take a look at our compatibility chart. Square gutters come in a choice of Black, Brown, White and Caramel, which is a light golden brown colour often used on conservatories. 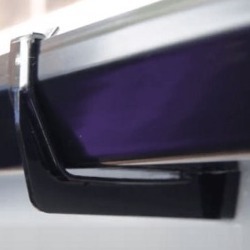 The standard connection is to a 65mm square downpipe. 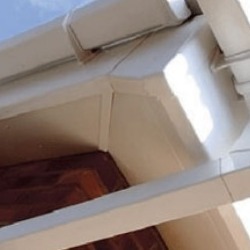 You can also connect square gutters into circular downpipes by using the RDS2 adaptor (not available in Caramel). Square downpipes can be connected to the drainage system by using the D96 Universal Rainwater Adaptor. Floplast Square Gutters and Downpipes are British Standard Approved and are covered by a 20 year mechanical and 10 year colourfast guarantee. The flow rate and carrying capacity of Floplast Square Guttering is approximately twice that of the Half Round System. Please visit our Guides and Tips section to view and download installation instructions.